Recruiting Software is helpful for the recruiters. It enables in managing the entire process of recruitment, right from finding suitable employees to hiring them. Recruiting software includes categories of the software application for the process of hiring and sourcing. Such software is typically incorporated into the Human Resource Management Software (HRMS) of the company. While such solutions make life easy by their implementation, it is very difficult to find a perfect software that fulfills all your needs of the recruitment process. 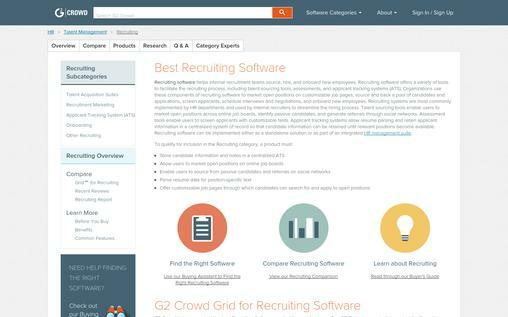 Here is a list of the top 10 recruiting software. 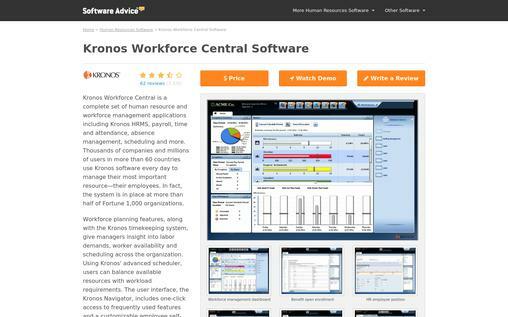 Developed by Kronos, Kronos Workforce Management helps companies in providing tools for workforce organization, globally. Launched in 1977, Kronos has developed ideas for providing them to companies which helps optimizing salaried as well as their hourly workforce. Kronos Workforce Management includes a set of cloud-based workforce and Human Resource Management applications like Payroll, HRMS, Absence Management, Attendance and Time. It is helpful for the companies in strategizing and managing the workforce in order to maintain a better organization. Industries like Hospitality, Aviation, Government, Healthcare, Life Sciences, Higher Education, Retail, Oil and Gas, Contract Services and others are dealt with under the management of Kronos Workforce. Compatibility of the workforce is with the in-house as well as other resource planning systems of the enterprise like SAP and Oracle. 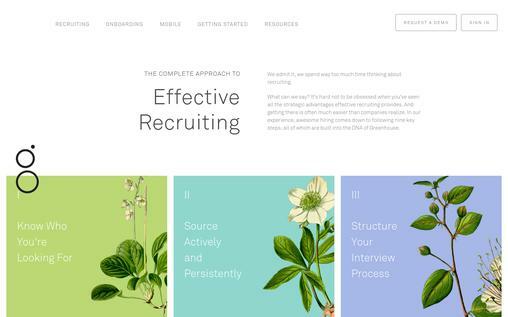 First recruiting platform in the world, Greenhouse helps in finding better candidates, conducting more focus interviews and making hiring decisions driven by data. Companies like TripAdvisor, Booking.com, and Airbnb make use of this software in their recruitment processes. The Greenhouse Recruiting Software not only tracks the applicants but also offer tools to the companies, which helps in managing the hiring process entirely. The software is scaled over the whole company so that the hiring teams make informal decisions. It starts with finding the right candidates for the job by incorporating various sources like job boards, external agencies, in-person events, and referrals. The greenhouse is mostly suitable for midsize and growing companies. An online recruitment software, Zoho helps the staff agencies and the recruitment departments in tracking their resumes, job openings, clients, candidates, and contacts more efficiently and quickly. With its help, less time is spent in the process and the paperwork. Zoho Recruit is entirely web-based, making its implementation simple and easy as no hardware needs to be purchased and maintained. Integration with Google apps like Google Calendar helps in saving time and avoid repetition of data entries. A contract for long-term is not required for its usage and the software trial is free, making it more popular among the recruitment software. 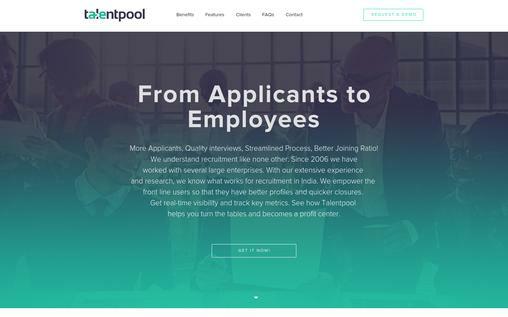 Talentpool is a consulting software company dealing in Human Resource Management and it operates worldwide. The services of Talentpool range from recruiting, consultation and staffing to assessments, training, and outsourcing. The functionalities and features of the software are built in accordance with the scenario of recruitment in India. It provides flexibility of workflow to all including Recruiters, Line managers, HR managers, and CHRD. The application is easy to use and can be adapted readily. Major companies like Reliance Power, TATA Steel, Voltas Limited, Huawei, Cytel and many more are associated with Talent pool. 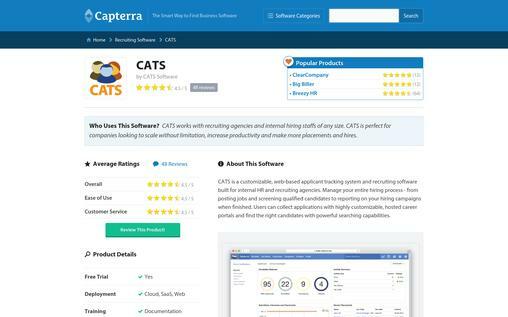 A complete solution for recruitment, CATS, is a customizable applicant tracking system that is entirely web-based. It helps in organizing the hiring process more efficiently by collecting applications for the job, automatically syncing the communications by e-mails and searching the inside of resumes so that best candidates are acquired for each and every position. Popular tools like Constant Contact, MailChimp, Slack and WordPress are used to work with CATS. The customers of CATS includes everyone that requires to hire like technology startups, staffing agencies, companies of Fortune 500, non-profits and recruiting firms. It is a web-based software that is used to track the applicants. 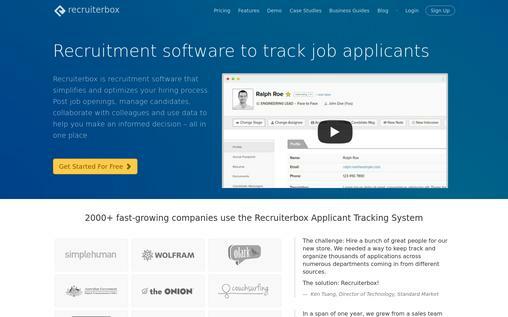 Recruiterbox helps small and growing companies in managing their job applications. No fixed contracts are required to associate as the pricing is according to the usage of the software. It helps in performing faster recruitments along with the ease of use. Recruiterbox is considered to be the most user- friendly for small companies, making it more reliable. 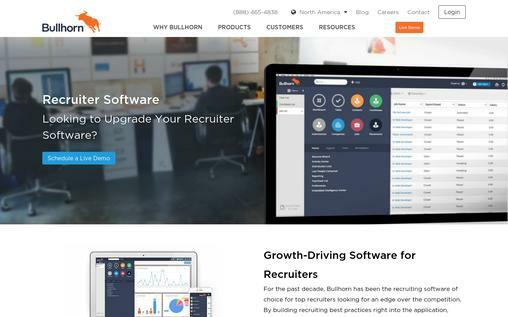 More than 700 growing companies make use of Recruiterbox for receiving applications of the job. Skyscanner, Stripe and Levis teams managed growth in their operations with the use of this software in their recruitment processes. Internet Collaborative Information Management, iCIMS Inc. is a private software company in America. 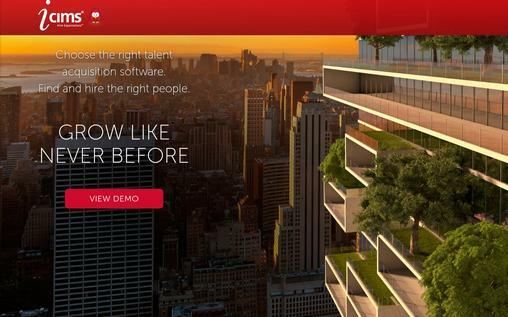 Founded in 2000, it offers a software that is cloud-based. Three products are included in the software namely- iCIMS Recruit, iCIMS Connect and iCIMS Onboard that enables the employers to find and hire the best candidates. The processes can be customized as per the likings of the user. Specifically designed for nurturing passive candidates, the iCIMS offers its customers to connect the systems of talent acquisitions as per their ability in one recorded platform. More than 3200 customers are associated with iCIMS. G2 Crowd gives the platform for software reviews of the businesses. Nearly 70,000 buyers of software use the application each month in order to make their purchasing decisions better. The company started yet another program, G2 gives for non-profits in which opportunity is given to them in finding the right partners of technology in order to deliver missions. It is based on professional recommendations. The users of the software get reviews from people using similar solutions, which are unfiltered. Users are also able to get an accurate likelihood of the success they are going to get while making the community contribution. 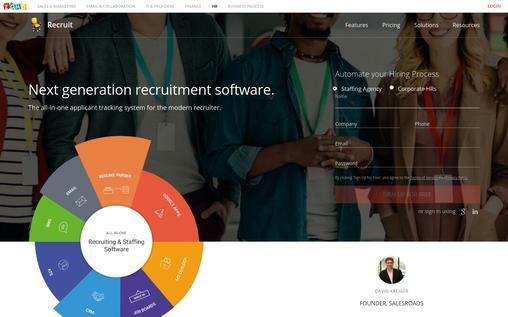 Bullhorn Applicant Tracking System helps the recruiters in making decisions better, improving sales and productivity and managing the entire process of recruitment along with the ease of use. All business size needs are dealt with in the system to fulfill the requirements of the recruiting firms. Bullhorn is a company based in North America that helps the companies to strengthen their relationships with clients. Strategic Staffing Solutions, Adams Consulting Group (ACG), Procom, Mclaren and many more companies are happily associated with Bullhorn and experienced more customer base and growth. 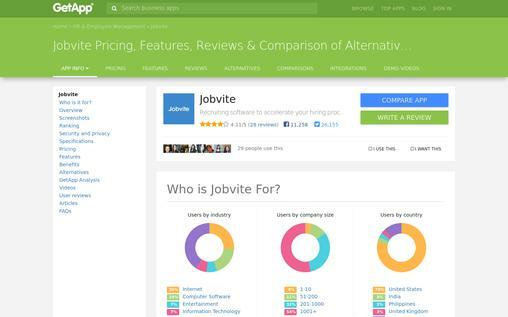 Jobvite recruiting platform was founded in 2006. The software has been designed in order to help companies in hiring talented personnel. Each stage of recruitment is supported by sourcing to the onboard of selected employees. It is a Candidate Relationship Management (CRM) system that helps in providing relationship and sourcing tools in order to track and manage the talent pool. It is a Java-based software, providing scalability and security. These above mentioned ten best recruiting software’s will surely help you to improve your business standards. Management of the entire process of recruitment become easier by using these some of the best recruitment software’s. Automate your recruitment within clicks and get complete recruitment analytics using this software. These available recruiting software consist of different categories of the software application for the process of sourcing and hiring. Don’t lag behind your competitors in the promotion of your job board or recruitment portal. Email marketing can make a way out for it to keep you on top through the means of MailGet Bolt.